Henricus Hondius (1571-1651) was one of the most well-known and well regarded Dutch cartographers of his time. The actual title of this work is, “Nova totius terrarum orbis geographica ac hydrographica tabula”, which means “A new complete map of the geography of the earth and oceans”. As you can see, it represents an almost psychic view of the world, given the fact that mariners had yet to fully explore the west coast of North America, which is often missing even in later maps. Hondius’ map is highly embellished with artwork, including tropical palm trees, sailing vessels and sea creatures. It is as much a work of art as it is a work of amazing cartography. 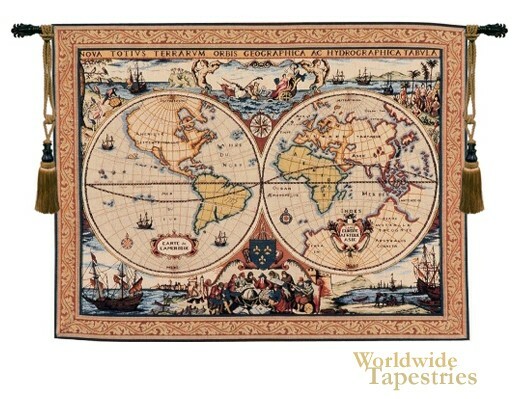 Nova totius terrarum tapestry is lined and has a tunnel for easy hanging and display. Note: tapestry rod and tassels, where pictured, are not included in the price. Dimensions: W 32" x H 25"
Dimensions: W 45" x H 35"